3 Beds 3 Baths 2,250 Sq. ft. Description: Located on the 15th hole of the maples golf course, one of three courses in sea trail plantation in sunset beach. 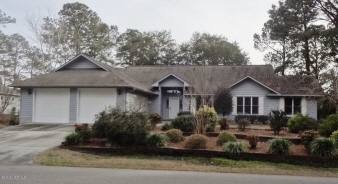 This three bedroom, three bath home offers an open floor plan and an office/den. The large living room/great room features a stone fireplace with access to a very large screened porch. From the porch there are great views of the golf course and the beautifully landscaped yard. As a resident of this community, an array of amenities including 2 outdoor pools, 2 resident clubhouses,tennis courts, library, community garden, fitness facility, and private parking on beautiful sunset beach.